Iran says it has successfully tested a new medium-range missile, in defiance of US President Donald Trump. 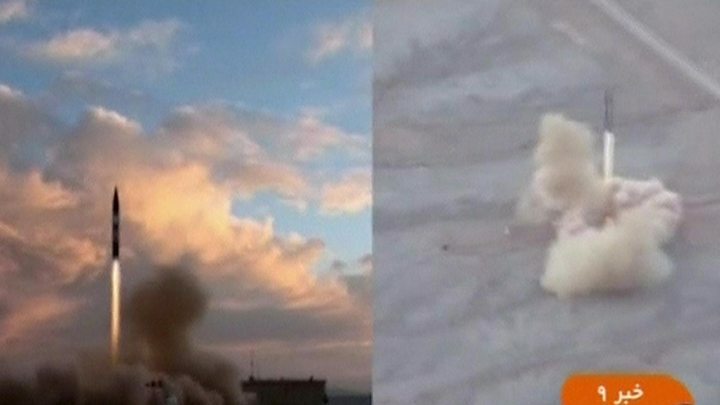 The launch of the Khoramshahr missile, which has a range of 2,000 km (1,242 miles), was shown on state TV. It is unclear when the test took place. On Friday, Iranian President Hassan Rouhani said Iran would increase its military power "as a deterrent". US President Donald Trump criticised the launch, saying the missile was capable of hitting its ally Israel. The Khoramshahr missile was first displayed at a military parade on Friday in Tehran. It is capable of carrying multiple warheads, Iranian media report. What will happen to the Iran nuclear deal? Iran's Defence Minister, Gen Amir Hatami, outlined the missile's "unique specifications". "The ability to evade the enemy's air defence line and to be guided from the moment of launch until the target is hit turns Khoramshahr into a tactical missile," he said. Iran would "not seek permission from any country for producing various kinds of missile", he added. By test-firing a new missile, Iran is sending another signal of defiance taken straight from the North Korean textbook. The missile test is arguably a borderline case as far as the UN Security Council is concerned. A resolution calls on Iran not to undertake any activity related to ballistic missiles designed to be capable of delivering nuclear weapons. Iran's test is a message to the US that it is determined to defend itself in any way it sees fit but it could also ultimately work against Iran as world public opinion will compare it to North Korea. Missile tests in Iran are said to require the approval of Mr Rouhani, and now it seems he has been pushed into a corner with the hardliners in Iran who see the North Korean path as the best response to Mr Trump's rhetoric and his disdain for the nuclear deal. The US announced fresh sanctions on Iran in July over its ballistic missile programme and what it said was Iran's support for terror organisations. It also imposed sanctions on Iran after a ballistic missile test in January. It says such launches violate the spirit of the 2015 agreement between Iran and six world powers to limit its nuclear programme in exchange for sanctions relief. In a tweet on Saturday, Mr Trump criticised Iran and accused it, without elaborating, of co-operating with the North Korean regime. Tehran insists its missile programme does not contravene the agreement. It says the missiles are not meant to carry nuclear warheads. At the UN General Assembly this week, the US and Iranian leaders traded barbs. Mr Trump included Iran among a "small group of rogue regimes", said its government was bent on "death and destruction" and said the nuclear agreement was an "embarrassment" to the US. 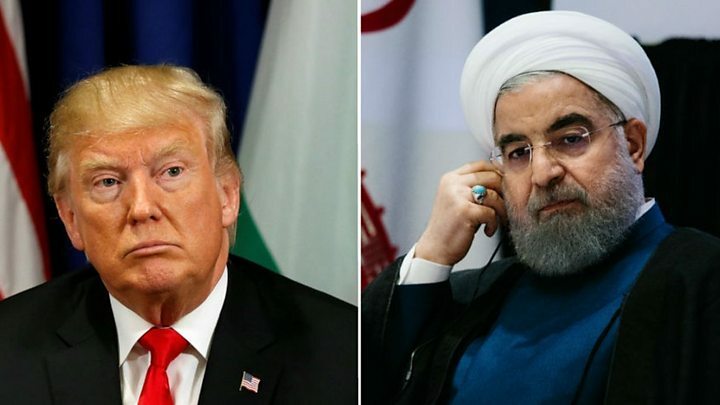 Mr Rouhani responded by referring to a "rogue newcomer to international politics" and deplored the US leader's "ignorant, absurd and hateful rhetoric". He said his country would "not be the first" to violate the deal, which Mr Trump has threatened to pull out of despite other signatories and international monitors saying Iran has stuck by its terms. On Wednesday, Mr Trump said he had already made up his mind but would not yet reveal his decision.